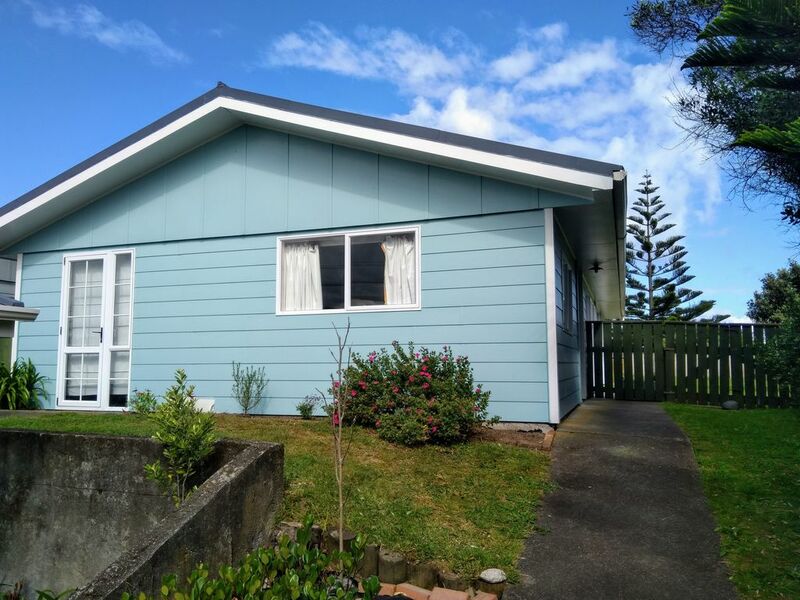 This is an excellent holiday home in Waitarere, with three bedrooms, twin lounges, spa bath, large kitchen-dining room, and a sizeable fully-fenced backyard. The kitchen and lounges are well stocked with gadgets, utensils and games. The main lounge has an excellent fireplace, and there is a TV, DVD player and Freeview box. The house is one street back from the beach, and only a few minutes walk from the lawn bowls club. The excellent 4 Square grocer/deli is a 10min walk. The woods are a short distance away for walks or jogs. If you need to visit Levin or Foxton, they are both about a 15 minute drive away. This is a family house so families as guests are preferred. Five adults is the MAXIMUM the house can manage. We are fond of animals so you can bring your dog, but make sure he doesn't eat the furniture and leave hair everywhere. If you want to smoke, go outside please. NOTE: Under bach tradition you need to vacuum the house and do the dishes before you leave; Also bring your own linen (towels/sheets/tea towels). I love to watch tv so the set here is a grave disappointment as a third of the picture is missing.I doubled up the couch cushions,so that I didn't sink to the boards.I found the bed in the front of house too soft so that partner disturbance was a problem.The shower trickles. On the other hand,the kitchen was well appointed,the dishwasher and washing machine worked very well.The fences are great and being able to stay with our dog was the big draw card.We have picked up all his poos and an awful lot of other ones.I wish people that stayed before us had had the decency.Not sure what to do with the rubbish we created,saw recycling in the garage and added to it. Great place - really spacious! Thanks so much for a lovely weekend away. It was a great place to stay. Thanks! Our first time to this beach and we enjoyed the town. Bach is well stocked and nicely located. It’s definitely a traditional Bach experience, though. Kids took awhile to get past musty smell, but once we opened windows and opted to spend lots of time outside, we had a nice time. Great to have a fenced backyard for the dog! All the essentials and and a great place to chill out near the beach.